On days like today you can't help but wonder why there yet remain those who doubt Sebastian Vettel's potential. Those that say he's just a gazelle, capable of running by himself when all is easy, or that his success is purely a function of Adrian Newey's design genius. It's not clear what their number is but at the very least they seem to shout loud. It's also not clear if they're watching the same F1 races as the rest of us. Yet perhaps it's true what they say: the less they know the more stubbornly they know it. Today's Nurburgring win was not the work of a gazelle. 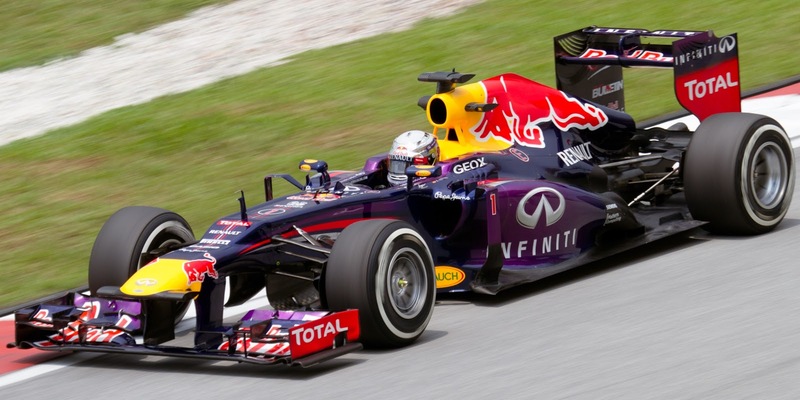 There may have been faster cars over the duration of today's German Grand Prix than Seb's Red Bull. Certainly for most of the way he drove under pressure, with opponents never far behind. Various varying strategies among his challengers swirled all the while like sharks in a pool. And in the late laps the pressure ratcheted up further, with none other than Kimi Raikkonen closing down on him at a rate of knots, benefitting from fresher and softer Pirelli boots. Despite everything, in an exercise that appeared akin to spinning plates, Seb remained in a net first place throughout. And he was still there at the end. There wasn't the slightest error from him for the duration, nor did there seem to be the slightest possibility of one. It was a masterful performance, and Seb was justified in sounding delighted afterwards, and not just because it was his first win at home and it extends his championship lead after his Silverstone gearbox misfortune. But even with the familiar result for first place today was a day for re-assessments. It seemed most likely in advance that the much-analysed changes to the Pirelli tyres would assist those - such as Mercedes - who had been struggling to get the tyres to last, and be to the detriment of those - such as Lotus and Ferrari - who'd been doing just fine on the previous tyres thanks very much. But we should know by now that nobody knows anything, and that the competitiveness of F1 cars in particular has a lot of voodoo about it. The evidence in the German race was that the opposite is true, Lotus and Ferrari were right back on it while Mercedes sank in a way that we thought was long behind them. It's a reminder that Merc's recent good form has come at tracks where tyre wear is low (Monaco and to a lesser extent Canada) and/or at tracks where the tyre compound selection was more conservative than it might have been (Silverstone and again to a lesser extent Canada). The selection for the next round, in Hungary, is ultra-conservative, but beyond that you wonder if it's back to the drawing board for the Silver Arrows, and of course they don't have a young drivers' test to help. Suddenly the long shot championship talk looks borne of fantasy again. But then again, in Hungary the tyres change again so a further re-assessment may yet be required. For Lotus though it was an impressive bounce back after what had seemed an inexorable slide away from competitiveness since Melbourne. The only regret was that the team couldn't transform it into a win, and Team Principal Eric Boullier commented afterwards that it feels like 'first place lost' rather than a second and third gained. But with a weaker-willed driver than Seb at the front the win presumably would have been theirs. 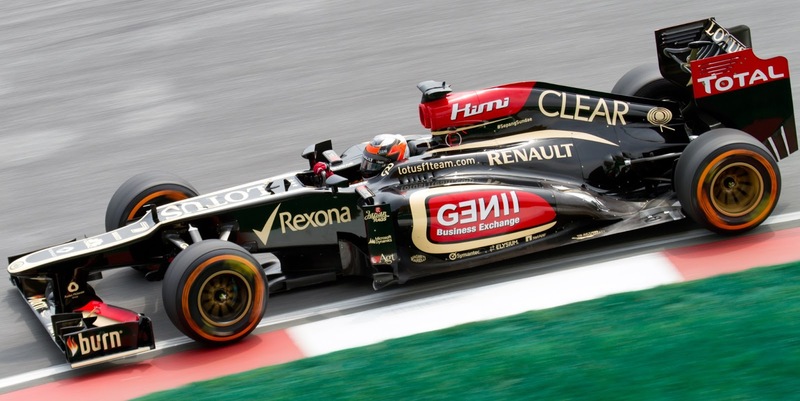 It might still have been theirs had Kimi not run out of tyres just when he most needed them in the last couple of laps. And it was very much a two-pronged Lotus attack, as Romain Grosjean put in an excellent run, following on from his hints at better form in Silverstone a week ago. Set up by an amazing 15-lap run on the soft tyre at the start, about double the most optimistic expectations anyone had at the outset, for most of the way he was Seb's closest challenger and nibbled at his lead. He had to cede to his stable mate Kimi late on - the Lotus pit wall making their expectations clear on that one - but he held off a late charge from Fernando Alonso to complete the podium. And it isn't half timely for Grosjean, as speculation over who'll fill the Enstone seats for 2014 has started to click into gear. If he keeps this up for the next few races it'll be amazing how quickly everyone forgets about his previous maladies. 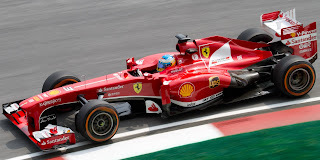 And Alonso will be relived to have a competitive run, finishing only 7.7 seconds behind Vettel after being his as usual tenacious self, having spent most of the last seven days looking to be nowhere near him. And he took fourth place despite his contrary strategy not really working, Grosjean indeed getting longer on the softs in the opening stint than Alonso managed on his mediums. Still, he lost 13 points to Vettel in the title chase. In better news, he's got only one race in the next six weekends, so some time for the Scuderia to get it right. But ultimately, it was exactly the sort of Sunday the sport needed after recent troubles, on and off the track. A tight, exciting four-car battle for the win, a variety of tyre strategies being played out and converging at the end, and a DRS that made passing possible but not too easy. Exactly what the formula is designed to create in other words. And most important of all there was not a single tyre failure. Let's hope for more of this to come. The only false note was provided by an incident in the pit lane, wherein Mark Webber was released with a rear wheel not attached, and the wheel collided with a cameraman at sickening speed. At the time of writing the cameraman's injuries were, mercifully, light. But the issue of who is in the pit lane during a race, their protection, as well as the issue of unsafe releases, will be looked at again. Also at the time of writing, the punishment for Webber and/or his team is not known. He salvaged P7 but that may yet be under threat. Otherwise it was a good day for the sport, and a compelling afternoon's action. Making the chase for the driver's title just as compelling won't be the work of a moment though.